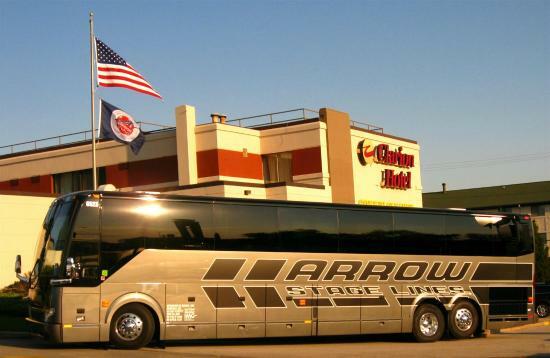 We like to have installed, in every town where we operate a hotel, facilities for servicing motorcoaches. I learned some years ago that the availability of these is of great value for pursuing and successfully booking bus tour business. These would include a prefab outbuilding to store your necessary tools and supplies, located to a fresh water connection and a lavatory dump. We don't want to use the lav dump as a commercial RV dump. (And the design will differ from the one shown above -- which is designed for RVs, not motorcoaches specifically -- to not encourage such inquiries.) Heavy use would generate a mess and odor problem. But motorcoach tour operators that I've dealt with in the past are particularly appreciative of an amenity such as this. They don't pursue discounts very aggressively -- they just pass the costs of the rooms to the tour customers, anyway -- but they like being able to have the coach serviced; and with Trailways no longer in business in most parts of the country, there aren't that many places to get it done any more. We have a maintenance guy there when a coach is scheduled to arrive to help unload the coach, we have the driver park the coach over the lav dump, we dump the lav and hose down the area around the dump spot; we swab out the lav, refill it and dump in some de-germ, we sweep and mop the coach and get the interior looking nice and fresh, and we wash the coach. Total time, one guy, a little over an hour, maybe two hours if you want to give it a really good job. (And we do. As you can guess, I worked for Trailways years ago, when there was a Trailways...). Small price to pay for being able to rent an extra 25-50 rooms in a night, even if we have to give a free room to the driver.